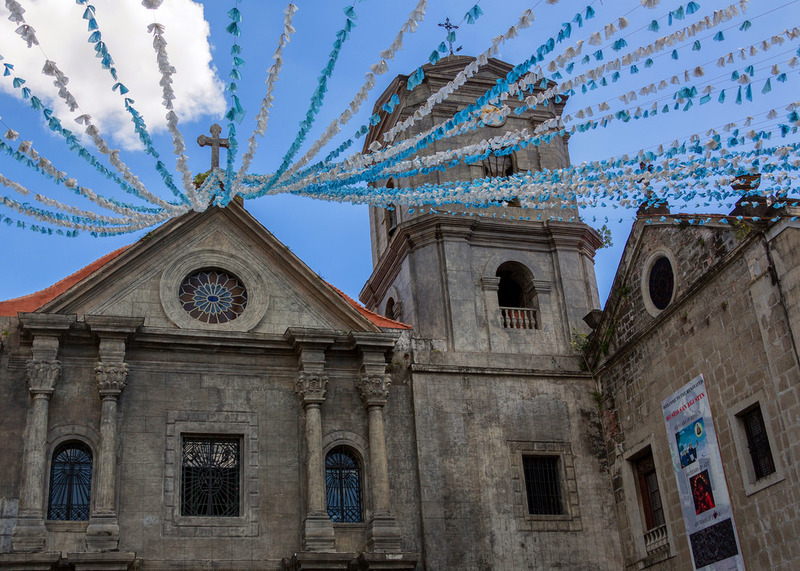 Getting to Manila was a good reintroduction to the importance of patience while traveling. From Denver I flew to LA, where a five-hour layover already had me antsy before the big 15-hour flight to Guangzhou, China, which was followed by another long layover. The smog outside the Guangzhou airport was so thick I failed to realize that a slight brightening of the flat gray sky meant the sun had just risen, which did nothing to increase my excitement about China as a future destination. Finally my third flight touched down in Manila and I was set to explore a Southeast Asian country that would be entirely new to me. Big cities aren’t my favorite. I planned to get out of Manila quickly and maximize my time on the three Philippine experiences that interested me most: seeing the rice terraces in the Cordillera of northern Luzon, swimming with whale sharks in Donsol, and exploring the raw natural beauty of Palawan. I thought two nights in Manila would be about right, just long enough to adjust to the new time zone and arrange a trip to the rice terraces. My first exposure to Manila made me wish I wasn’t even staying one night. I’ve seen bad traffic before – LA freeways, Bangkok at rush hour, downtown Delhi, central Kathmandu – but nothing like Manila. The four-mile taxi ride from the airport to my hotel took over an hour, most of it spent immobilized in bumper-to-bumper traffic. “Patience very important here,” my taxi driver advised me with a pained expression on his face. “Is it always this bad?” I asked. “Only Monday through Saturday,” he said without smiling. The taxi’s radio played a string of dated pop love ballads, my first evidence that musical taste in the Philippines doesn’t diverge much from the rest of Southeast Asia. Whitney Houston belted out “Greatest Love of All” as we sat in gridlock. In between songs the DJ gave an update, in English, on Donald Trump’s performance in the Michigan primary. Skyscrapers lined the streets, mostly bland residential towers that seemed to be gradually disintegrating in the heat and humidity, tired and overworked. I collapsed in my hotel room, fell asleep too early, and woke up at 3am, which gave me plenty of time to figure out how to get to the rice terraces. The only real option, unfortunately, was a bus leaving at 10pm the next night and arriving at Banaue 7-8 hours later, so I bought a ticket. I checked out of my hotel the following morning and decided to spend the afternoon in the Intramuros neighborhood, basically Manila’s old city, surrounded by stone walls the Spanish built 400 years ago. According to Lonely Planet, Fort Santiago in Intramuros is “Manila’s premier tourist attraction.” It probably should have worried me that my taxi driver said he’d never heard of Fort Santiago. More scribbling. “Can we take a picture with you?” Ha, I wouldn’t have guessed I’d be asked that question on this trip before asking it myself. I was so surprised I didn’t even think to get a shot with my camera, too. Later on the way to the bus terminal my cab driver asked, “No women here for you?” It’s disturbingly common in Manila to see an old Western man with a young local woman, a problem across most of Southeast Asia. It bums me out that being a middle-aged male traveling alone can be enough to raise the suspicion of potential creepiness. “Bad. But too many girls in the villages, too poor.” He used this as the starting point for an analysis of his country’s interconnected problems. Poverty, too many people having too many kids they can’t afford, a widening gap between the rich and poor, people forced to pay crushingly high interest rates because banks won’t lend to them, ridiculous traffic. “But the big problem behind all others is political corruption,” he concluded. I showed up at the bus terminal far too early and found myself with yet another opportunity to practice travel patience. Something I’d eaten wasn’t sitting well and I was worried about committing myself to a long ride in a bus with no bathroom. That whole day I’d been so attuned to every minute signal coming from my stomach that I felt like Tom Joad monitoring the family jalopy as it struggled to cross the Rocky Mountains. At boarding time the situation seemed stable, so I crossed my fingers and got on the bus.